I&apos;ve always been a little afraid of urinals so it&apos;s difficult for me to say, "yay, this is exciting." But, I guess—objectively—it&apos;s a big deal that San Francisco&apos;s Dolores Park is getting its first open-air toilet. It&apos;s essentially a little cul-de-sac covered with a covered net where dudes can relieve themselves—in more ways than one. The effort is all part of a remodeling of Dolores Park, which lies in the vibrant Castro neighborhood of San Francisco. According to Daily Intelligencer​, the city also plans to add 26 public restrooms around the Park. These, however, will be more traditional and, you know, less in your face. But at the end of the day, the open-air toilet speaks to a larger issue that has been plaguing San Fran for some time. The California city has a urine problem, so bad that they covered walls with urine repellent paint, which will spray your pee back at you if you pee over it/on it. In addition to this magic paint, the city passed a law that would charge offenders with a $50 to $100 fine. "The more options we can give them to relieve themselves, the better for the park-goers,” San Francisco Supervisor Scott Wiener told the Los Angeles Times. "The better it is for neighbors." If you ask me, part of the appeal of peeing in public—or doing anything in public really—is the risk of getting caught. 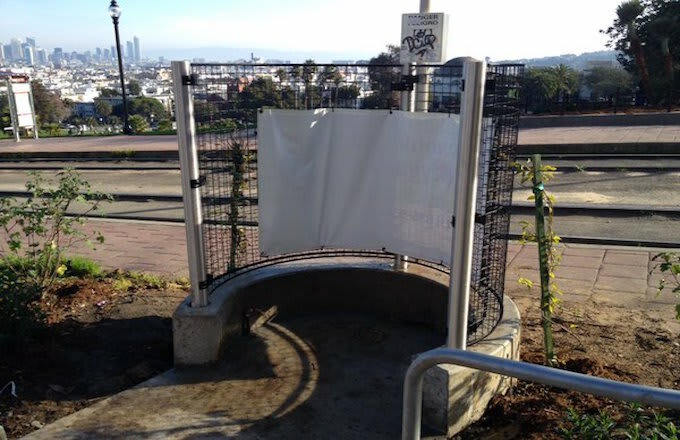 I doubt this open-air toilet will do much to solve San Francisco&apos;s pee problem. If anything, it seems like an ideal place to to get into some other more scandalous things (but maybe that&apos;s just where my mind goes).